Scheduled Maintenance | Metro Transmission Inc. Setting up a scheduled maintenance program for your vehicle is one of the most effective ways to keep your vehicle on the road longer and avoid costly repairs. Our ASE certified mechanics can work directly with you on creating a custom maintenance program that works for your vehicle, your wallet, and your calendar. We know that regular maintenance can easily be overlooked and we do all that we can to make the necessary maintenance of your vehicle a simple task in your busy schedule. With over 30 years of experience, Metro Transmission and Automotive is a trusted name in the industry that was built on our client’s satisfaction and word of mouth. 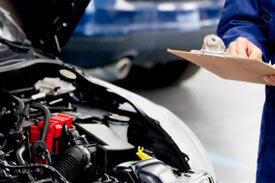 Do you have a vehicle that is currently under a warranty? We are experts in following the recommended maintenance program of any vehicle still under a manufacturer or extended warranty. Our experience allows us to fully understand the requirements of maintaining your vehicle to the manufacturer’s standard, and we can provide you with a recommended maintenance schedule. What’s included in a scheduled maintenance Program? At Metro Transmission and Automotive we perform the following items at each of your scheduled maintenance appointments. Beyond the obvious benefits of having a scheduled maintenance program, it can also increase the value of your vehicle should you ever decide to sell it. Having a solid and detailed record of all maintenance is a huge selling point, and shows the car was consistently taken care of. If you are interested in our scheduled maintenance service, please give us a call today or fill out our online form now.